Whitney Houston performing in Germany in 2009. Houston died in Los Angeles yesterday, aged 48. 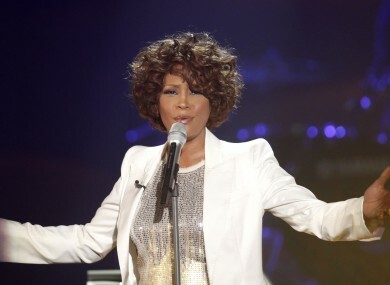 SINGER AND ACTRESS Whitney Houston has been found dead in a hotel room in Los Angeles. She was 48. Houston was pronounced dead in a room at the Beverly Hilton hotel shortly before midnight Irish time. Her body remained at the scene last night. Houston had ruled as the queen of pop music, until her voice was ravaged by drug problems, and her public persona tainted by erratic behavior and a tumultuous marriage to singer Bobby Brown. Beverly Hills police Lt. Mark Rosen said there had been “no obvious signs of any criminal intent.” Houston’s publicist, Kristen Foster, said the cause of death was unknown. Rosen said police received a 911 call from hotel security about Houston at 3:43pm local time. Paramedics – who were already at the hotel because of a pre-Grammy Awards party – were not able to resuscitate her. Organisers of the Grammys, which are to go ahead this evening, said singer and actress Jennifer Hudson would lead a tribute to Houston at tonight’s awards. Houston was supposed to appear at the gala, and Davis had told The Associated Press in advance that she would perhaps perform: “It’s her favourite night of the year … [so] who knows by the end of the evening,” he said. Houston had been at rehearsals for the show Thursday, coaching singers Brandy and Monica. The person said Houston looked dishevelled, was sweating profusely, and alcohol and cigarettes could be smelled on her breath. Two days ago she had performed at a pre-Grammy party singing the gospel classic “Jesus Loves Me” – her voice registering softly, not with the same power it had at its height. “The morning of the Grammys, the world should pause and pray for the memory of a gifted songbird,” Sharpton said in a statement. A 2009-2010 European tour had confirmed her descent – a performance on The X Factor to promote her tour was better remembered for Houston’s lackadaisical performance, while fans openly booed at concerts in frustration at her poor showings. Email “Whitney Houston found dead in Los Angeles hotel room”. Feedback on “Whitney Houston found dead in Los Angeles hotel room”.